Or TubeLondon: Discovering London by Underground, to give its full title. This is an easily digestible book featuring loads of interesting things to know about Central London, using the tube system as the framework to hang the content on. You’ve got to have a system, as Harry Hill says, but it’s not gratuitously done because each of the 62 Underground stations featured are themselves covered with engaging background information. Some of these, of course, are also London’s first generation mainline termini. As a middleweight scholar of the Underground (i.e. a wind cheater rather than an anorak, perhaps), I was pleased to find lots that I didn’t know. It is interesting, for example, to discover who the architects were on new Underground stations not designed by Leslie Green or Charles Holden. I like the factoids attached to stations’ early history, that Bond Street was originally to be called Davies Street. And so on. Each station is designated about half a dozen features, buildings or otherwise interesting facts about the immediate vicitity. I suppose this gives us approximately 400 or so items to enjoy. All of these entries are well-chosen, well-researched and well-written. They are accompanied on most spreads by two or three colour photos, or – as below – a full page picture. These are all remarkably fine images. I discovered they were taken by the author herself, who was too modest or forgetful to mention this anywhere. I may be wrong, but I’m guessing that TubeLondon was produced in the Far East. It has that Dorland Kindersley glossy quality about it which is most pleasing and which will look very handsome on your bookshelf when not being dipped into. For it very much is a dipping into kind of book, which I have every intention of finishing in that mode. It’s also, I’d like to suggest, an excellent gift book. 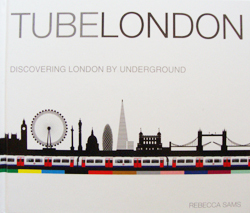 TUBE LONDON: Discovering London by Underground (2012) by Rebecca Sams is 160pp and published by Capital History. Cover price is £12.95.